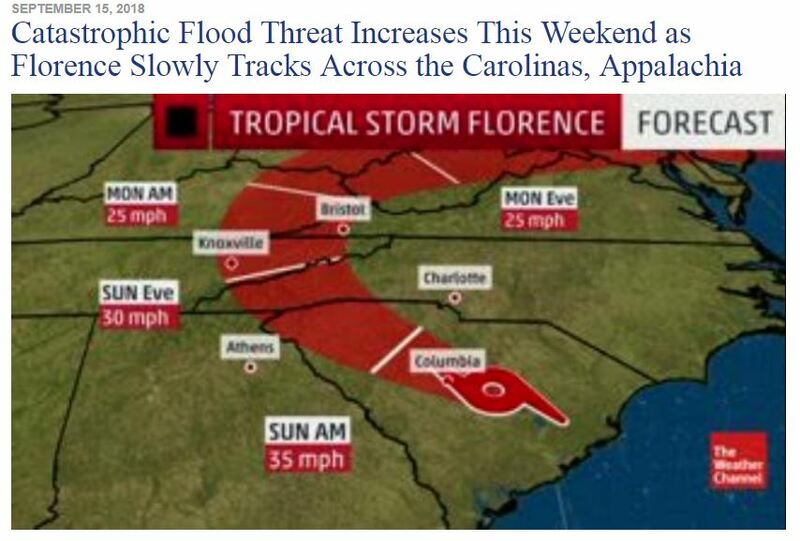 The Weather Channel: why climatology doesn’t have much of a say in Florence’s unusual track (click image for link). 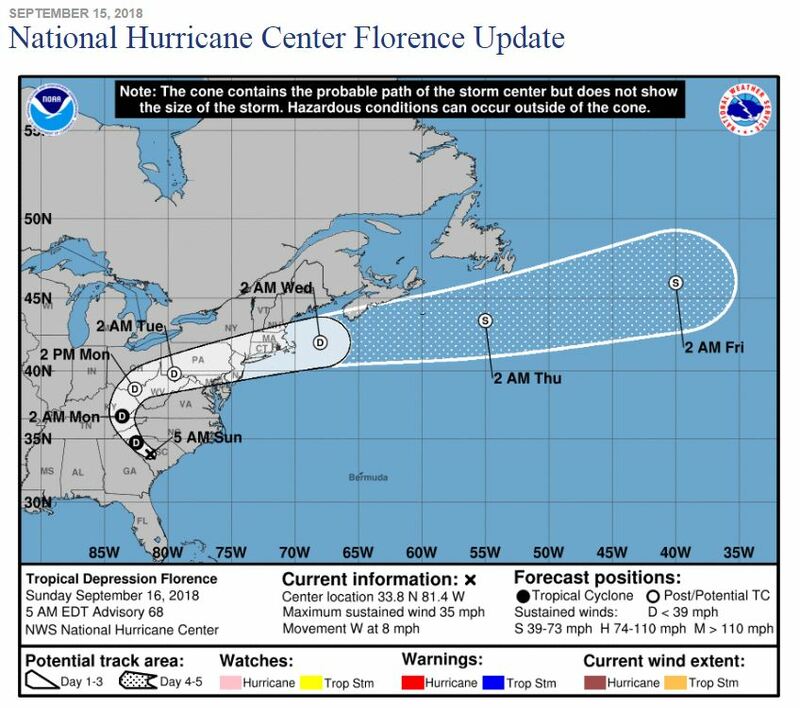 Not following news programmes over our long weekend other than for a quick-scan of William Koenig’s newsfeed, I did however notice one about Hurricane Florence making a ‘bizarre’ change of course approaching America’s eastern seaboard. This curious fact is reminiscent of the profound prophetic word Revd Dr Sharon Stone brought in 2012 about the special significance of Hurricane Sandy in changes the Lord is bringing to the influence of Christian history and giving a new spiritual direction and changing the course and identities of nations. The last part, on returning the UK and USA to their national identities, was unwittingly announced years later by President-elect Donald Trump (see Fulfilled Prophecy #15). A WORD OF SOBER WARNING: I SAW 7 MIGHTY WHIRLWINDS SIT UPON THE PALM OF HIS HAND AND THEN BEING RELEASED UPON THE NATIONS! ‘Last night just after midnight I was woken suddenly by a what I can only describe as a vision/dream it was very short and to the point. ‘Suddenly I woke up and found myself praying fervently in the Spirit, as I began to inquire of the Lord again I heard the Spirit say, “THE WHIRLWINDS OF MY SPIRIT WILL GATHER THE WHEAT AND SCATTER THE TARES, THE WHIRLWINDS OF MY SPIRIT WILL CAUSE A GREAT SHAKING, SIFTING AND SHIFTING TO TAKE PLACE IN THE NATIONS, WATCH! FOR A DIVINE DISRUPTION HAS NOW BEEN RELEASED UPON THE NATIONS”! AN URGENT WORD FOR THE UNITED STATES OF AMERICA…; WATCH! FIRST THE SHARP SICKLE OF TRIUMPH NOW THE SHARP SICKLE OF DIVINE JUSTICE AND JUDGEMENT SHALL FLY ACROSS THE NATION”, says God…! ‘While in Worship this morning as I was praying for the Nations of the Earth suddenly I clearly heard the Spirit of God say, “Daughter TELL THE NATION OF AMERICA TO GET READY, TELL THEM TO WATCH AND PRAY! FIRST THE SICKLE OF TRIUMPH NOW THE SICKLE OF DIVINE JUSTICE AND JUDGEMENT SHALL FLY ACROSS THE NATION, TELL MY PEOPLE TO BE PREPARED FOR THAT WHICH I HAVE SPOKEN AND THAT WHICH I HAVE PROMISED WILL NO LONGER TARRY BUT SURELY IT SHALL NOW COME TO PASS IN THIS NATION, FOR EVEN NOW MY GOVERNMENTAL HAND IS MOVING UPON THE WHITE HOUSE, UPON THE HOUSES OF CONGRESS AND UPON THE COURTS OF JUSTICE, WATCH! AS MY SPIRIT OF TRUTH, RIGHTEOUSNESS AND THE FEAR OF THE LORD COMES LIKE A SHARP SICKLE MOVING SWIFTLY, SEVERELY AND SUDDENLY UPON THE HEADS OF THE WICKED, LISTEN! FOR THE SOUND OF RIGHTEOUS RETRIBUTION WILL BE HEARD GOING FORTH ACROSS THE LAND, WATCH AND PRAY BELOVED, FOR THOSE WHO HAVE VIOLATED MY LAWS AND MY STATUES AND THOSE WHO HAVE KILLED THE UNBORN AND THOSE WHO HAVE BOWED DOWN TO THE IDOL OF BAAL IN THIS NATION WILL NOW BE GATHERED UP LIKE RIPE GRAPES ON THE VINE AND THEY SHALL BE TRODDEN UNDER-FOOT, WATCH AS THE SHARP SICKLE OF MY JUSTICE AND JUDGEMENT NOW FLIES FORTH ACROSS THE NATION OF AMERICA”! ‘The weird saga of Hurricane Florence, which has already carved an unprecedented path across the Atlantic, is forecast to persist with a strange stall and trek along the Southeast coast. ‘AccuWeather meteorologist Marshall Moss said Florence’s track is unique. “It was located farther north in the Atlantic than any other storm to ever hit the Carolinas, so what we’re forecasting is unprecedented,” Moss said. ‘Florence’s path has already been a weird one and it’s forecast to get stranger through the end of this week. ‘Many hurricanes follow very clear tracks, for example, a curve around the south and west sides of the Bermuda-Azores high in the Atlantic Basin, or just a straight buzzsaw through the Caribbean Sea. In these cases, the atmosphere’s steering flow is strong and persistent enough to keep the hurricane on a steady path. Forecast tracks of those are, straightforward. Also that day, MSNBC’s meteorologist Bill Karins gave a warning of a ‘big change’ in the storm, as reported over here in depth by the Daily Express. 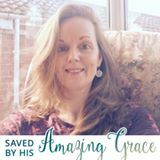 What happened during the first week of September 2011, followed by the Lord strongly and repeatedly nudging me, led from my emailing friends and a few church leaders on End-times to blogging for the world to read my musings – should they deem them to be of interest. I hope this ‘ping’ or ‘echo-signal’ of GPS #20 may give an indication of how heavenly Father, Son and Holy Spirit may be moving in our nations. “I’m in an open-plan, modern office environment overlooking a town centre. Upon glancing out of one side’s extensive windows I’m amazed to see a large white cube flying very low over nearby buildings! (It’s about the size of a Hercules transport plane.) Watching, I see a few more similar cubes follow and fan out in different directions. “Then I look from a different quarter’s aspect to see where they’re coming from and am notice this view is from a much higher floor and over a different location! Then, a couple of cubes hover and discharge some cargo, which floats down to settle on the ground – rather as furniture vans deposit items outside a house. “However, I’m seeing into a room being set up, as though the building itself is invisible! A large wooden table and its several chairs are already there as white porcelain bathroom furnishings descend, but remain hanging in space! “Someone else watching disparagingly quips, “Oh, that’s your perspective”. “A sudden urgency comes upon me to dash home with this news. Jumping into a car I find my normal route out of the building diverted and a huge vehicle tries to collide with me. Dodging that I drive up a slip road onto a choked road but find this very basic car becomes seriously under-powered. “So I get out to walk yet find all hard paving has turned into lush green grass of wide-open meadows. The congested road’s gone and I’m sliding down a well-worn grass slide to then run, or move, much faster than I can really run across an extensive area. I head a few dozen feet above the land, as though in a glider, and some very large object or person rushes from the left to block my path. Totally unfazed, I deliberately collide into it and it smashes into oblivion without halting or affecting my movement. Upon waking an initial interpretation came with great excitement because there were to be several revival meetings that month. I believe the Lord gave the above heading for my notes of this lucid dream. All this needed weighing BUT I didn’t expect confirmation and more insights not only in connection with the Gathering itself but also with the prophetic word reported at the Gathering’s Inception Meeting in Nov 2010! Thus, I believe the dream’s meaning is relevant to the Revival Alliance event and its proceeding out into the wider Church as the meeting was jam-packed with leaders from many churches across Britain. By the way, having noted the dream under the header ‘Your Kingdom Come’, I came to hear it’s the same title of the following week’s healing service in Winchester led by the Alliance’s member absent in the Ukraine – Randy Clark! This post by RJ Dawson is highly recommended reading. 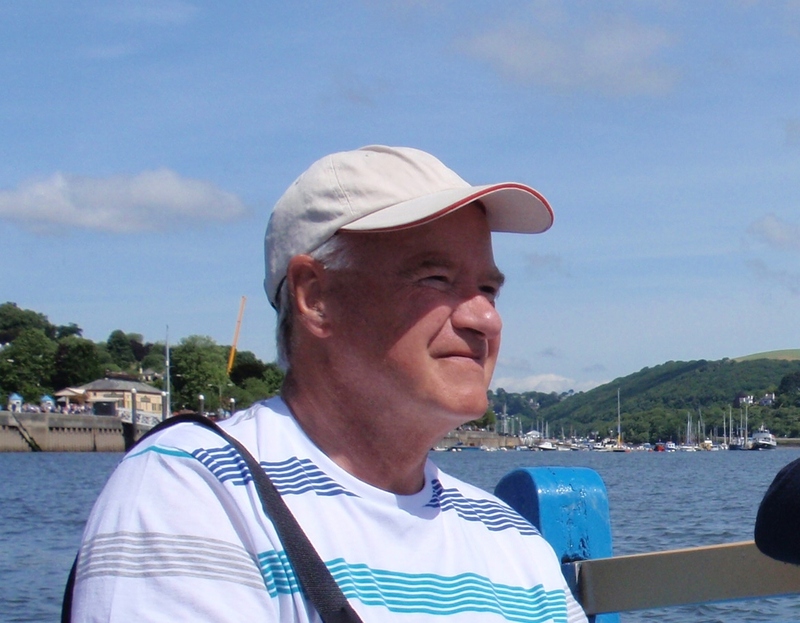 Note especially his remarks on the 8th anniversary of his blog and the section on the ‘present darkness’, as well as inserted remark upon his reading my previous post – the original of which was published by Veronika West 7 days prior to his own. I read both yesterday, hence my tagging this ‘God-incidence’ under God’s GPS (Global Prophecy Signalling) because it touches not only Ireland and USA but also Britain, in view of what’s been on my mind concerning 7 years ago this weekend (to be told in the next post). A POWERFUL VISION OF “A RAINBOW WHIRLWIND COMING OUT OF THE HEAVENLIES AND MOVING ACROSS THE NATIONS OF THE EARTH; WATCH! FOR THE MANIFOLD, MULTI-FACETED, MULTI-COLOURED WISDOM OF GOD IS NOW BEGINNING TO MANIFEST THROUGH THE CHURCH IN THE NATIONS OF THE EARTH”…! I wanted to share something real quick that was very powerful, last night during a time of prayer a powerful vision opened up before me where I SAW A RAINBOW WHIRLWIND COMING OUT OF THE HEAVENLIES WITH GREAT ACCELERATION AND UNSTOPPABLE MOMENTUM, NOW AS I WATCHED THIS INCREDIBLE WHIRLWIND I COULD SEE WITH GREAT CLARITY THE 7 COLOURS WITHIN THE WHIRLWIND, EACH OF THE COLOURS OF THE RAINBOW SWIRLED AND WHIRLED (my spirit being became entirely captivated and almost overwhelmed by its STRENGTH, BEAUTY AND GREAT POWER), EACH COLOUR OF THE RAINBOW MOVED IN WAVE LIKE MOTIONS, EACH COLOUR LOOKED ALIVE AND EACH COLOUR CARRIED A CERTAIN SOUND AND THE 7 SOUNDS THAT I HEARD COMING FROM DEEP WITHIN THE WHIRLWIND CAUSED A STRONG VIBRATION IN THE SPIRITUAL ATMOSPHERE, NOW AS I DREW A LITTLE CLOSER IN THE VISION, I COULD TANGIBLY FEEL THE ‘SOUND VIBRATIONS’ MOVING THROUGHOUT MY SPIRIT BEING, LIKE A TUNING FORK I BEGAN TO FEEL A POWERFUL AND DYNAMIC RESONANCE THROUGHOUT MY MIND, EMOTIONS, BODY AND SPIRIT A SUDDEN AND DIVINE SHIFT AND CHANGE BEGAN TO TAKE PLACE, A SUPERNATURAL REALIGNMENT BEGAN TO HAPPEN, I FELT MY SPIRIT BEING LIFTED HIGHER AND GOING DEEPER, THE EYES OF MY SPIRIT BEGAN TO SEE IN A TYPE OF 3-DIMENSIONAL WAY, I FELT A SUPERNATURAL QUICKENING TAKING PLACE OVER MY MIND AND ALL OF MY SPIRITUAL SENSES BECAME HEIGHTENED. “BEHOLD THE SPIRIT OF ELIJAH, FOR NOW IS THE TIME OF A GREAT AWAKENING IN THE NATIONS, NOW IS THE TIME FOR A MANIFESTATION OF THE MULTI-FACETED WISDOM OF GOD IN THE EARTH, NOW IS THE TIME OF A GREAT SHAKING AND A SUPERNATURAL SHIFTING AS THE KINGDOM OF HEAVEN INVADES THE EARTH, FOR NOW IS THE TIME OF REFORMATION, RESTORATION AND REVIVAL IN THE NATIONS, WATCH! AS MY MANIFOLD SPIRIT OF WISDOM NOW MOVES LIKE A MIGHTY WHIRLWIND ACROSS THE LAND TO AWAKEN THE DAWN OF A NEW DAY IN THE NATIONS OF THE EARTH”, says God. As I came out of this powerful vision I began to pray in the Spirit and it was quickened to me by the Holy Spirit (Ephesians 3:10, which says, “The purpose of this was to unveil before every throne and rank of angelic orders in the heavenly realm God’s full and diverse wisdom revealed through the church”! OR “His intent was that NOW, through the CHURCH, the MANIFOLD WISDOM of God should be made known to the rulers and authorities in the heavenly realms”! PS; Today I released a word to a Church in London where a month ago while visiting this Church I was shown in a vision “A WELL” and as I drew closer to the Well in the vision I saw that the waters within the Well were multicoloured like that of the rainbow and immediately the spirit of God spoke to me from the book of Revelation; “Revelation 4:2-5, ‘And immediately I was in the spirit; and, behold, a throne was set in heaven, and one sat on the throne. And he that sat was to look upon like a jasper and a carnelian stone: and there was a rainbow round about the throne, in appearance like unto an emerald. And round about the throne were four and twenty thrones: and upon the thrones I saw four and twenty elders sitting, clothed in white clothing; and they had on their heads crowns of gold. And out of the throne proceeded lightning and thunderings and voices: and there were seven lamps of fire burning before the throne, which are the seven Spirits of God. As I pressed in deeper to the vision the Spirit of Revelation showed me that the WELL WAS AN ANCIENT WELL, that the waters of the Well were the Seven Spirits of God and that MANY would be drawn from all four corners of the Nation/S to this Ancient Well and that this Well would become a place of DIVINE IMPARTATION AND ACTIVATION, and that all those who would drink of the waters would be REVIVED AND RESTORED, for this is the WELL THAT CONTAINS THE NEW WINE, and those who drink from the Well will NEVER THIRST AGAIN but they will become FULLY AWAKENED, THEIR SPIRITS WILL BE IGNITED WITH THE FIRES OF REVIVAL. The Spirit of Revelation clearly showed me that He is about to UNCOVER AND UNCAP THE ANCIENT WELLS OF REVIVAL ONCE AGAIN ACROSS THE NATIONS OF THE EARTH. SO FRIENDS, WATCH! FOR THE WHIRLWIND OF ELIJAH DRAWS NIGH, LISTEN! FOR THE SOUND OF A GREAT REVIVAL WILL BE HEARD, GET READY! FOR THE MANIFOLD SPIRIT OF WISDOM NOW BRINGS FORTH A GREAT AWAKENING, FOR A NEW DAY IS DAWNING IN THE NATIONS OF THE EARTH…! Violet – Spirit of the Fear of the Lord. ‘I felt a call to respond to the “frinkle” moment I had on reading your very recent call to prayer. It is truly amazing how themes are developed, by God giving to various people different pieces of the jigsaw. ‘The other morning I woke with the phrase “the darkest hour is just before dawn” in my mind. The conviction that we are now in the most intense time of prophetic fulfillment was very strong, as was the realisation that the return of Jesus (the second advent) will render biblical prophecy obsolete (I know there will be other millennial events to follow but we won’t need the Bible to tell us about them). ‘I am convinced that in our “New Testament” times the strategy has changed. Each “prophet” receives an element of a much bigger picture and it requires unity for the jigsaw to be completed. Friends of God live in the stream of prophetic enlightenment and recognise the signs of the times. With information and understanding comes responsibility! ‘Put another way, there are now many “mini-Elijahs” in the Christian community and, by the unifying process of networking, their various prayer groups will become the Elijah church: an essential bedrock which God is establishing in this nation and beyond. ‘Returning to 1 Kings 18, at verse 21 Elijah says “How long will you waver between two opinions” which might well be the mantra for prayer groups today. Do we really believe God is in charge? Do we really believe that God gives us signs (e.g. the EU displaying the “badges” of Babylon)? Do we really believe that God made a covenant with Abraham and his descendants? Answers to these sample questions will influence our views and prayers on God and Mammon, Replacement theology, Brexit and so on. AMEN my friend and how amazingly this fits into what I’ve recently learned, as will be revealed in a video to appear in the next post! In view of my blogging intentions of the past fortnight being being diverted back to the vital importance of Brexit, as in the picture and instruction Neil Mackereth received to cut and cast off the EU’s tentacles and mine, intercessors’ and readers’ reactions (including one for whom that and the previous post confirm personal prophecies of years ago), plus reactions to Justin Welby’s wayward words on the EU, I rejoice in Veronika West’s ‘God-incidental’ prefatory remark to last night’s live-feed video. She, too, had her attention drawn back to Brexit!! “I want to share something with you all as a matter of urgency really. As you know, I don’t generally do live feed…but this is a vision that God gave me about the nation of the United Kingdom – it’s really just about Brexit. 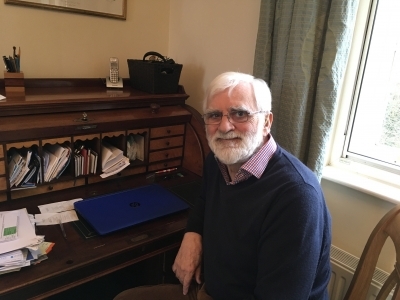 “In fact, it’s something I haven’t really been…that hasn’t been on my radar in the last couple of months – but yesterday I was busy around the house and I was praying and I was speaking to the Lord and the Holy Spirit kind of…He apprehended me really, and He said, “I want you to begin to pray for Brexit”. ”BREXIT; A BREAKING AWAY FROM THE EU, A DIVINE REVERSAL AND A SUPERNATURAL OVERTURNING WILL TAKE PLACE OVER THE LAND”! I was taken into a powerful vision yesterday morning where I saw a massive glacier floating on the ocean, now as I looked at the glacier in the Vision, I saw that there was a large iceberg firmly attached to the outer edges of the glacier. Now as I drew closer in the vision I saw that the iceberg was the Nation of Great Britain. As I looked at the Nation suddenly my eyes were drawn back to the massive glacier and as I looked again at the glacier I saw these words, ‘EU, the bloc‘. the berg swaying violently back and forth, and back and forth in the waters. “WATCH! For I AM turning things upside down and inside out, I AM will reverse and overturn the curse over the Nation of Great Britain”! “WATCH! For a great breaking away of the Nations from the EU will begin to take place in the days ahead as My Spirit moves mightily to dismantle and destroy the Stronghold of Globalism”! Then I felt the earth tremble and a great shaking began to take place over many Nations. Suddenly, my eyes were drawn back to the overturned iceberg and I saw that it had now become stable, and I watched as it floated away from the glacier. then I looked again at the iceberg and I watched as the light and heat from the suns ray’s began to shine brighter and brighter upon the whole Nation. “BEHOLD! THE FORMER THINGS HAVE COME TO PASS, THE NEW THING I NOW DECLARE BEFORE THEY SPRING FORTH, I TELL YOU OF THEM”! As I have prayed over this powerful vision and what it means for us as a Nation, the Holy Spirit began to show me that there is coming a COMPLETE BREAKING AWAY FROM THE EU. This breaking away will be a sharp severing of both spiritual and natural ties between the EU and the Nation of Great Britain. Furthermore, the Holy Spirit revealed to me that after the Nation breaks completely away from the EU, there will be a season where things will be violently shaken, the Nation will experience a time of even greater uncertainty and instability both Economically and Governmentally. This great and severe shaking will cause a mighty ripple effect which will be felt across many other Nations in the earth. I believe there will be many people in the Nation of Great Britain in this time who will feel like everything has been turned upside down and inside out. But as the Body of Christ we must STAND FIRM AND REMAIN STEADFAST, WE MUST STAY SECURELY ANCHORED TO HIS PROMISES OF FULL AND COMPLETE RESTITUTION AND RECOMPENSE FOR OUR NATION. WE MUST FEAR NOT!! For this violent shaking MUST COME for the work of rebuilding and establishing God’s kingdom purposes in the Nation. I PROPHESY GREAT BRITAIN WILL SEE A GREAT SPIRITUAL AWAKENING TAKING PLACE OVER THE LAND AS THE NATION BREAKS FREE FROM THE EU. GREAT REVIVAL AND KINGDOM REFORMATION WILL BE BIRTHED IN THE NATION. Listen friends! The Spirit of Elijah is coming to the Nation of Great Britain like a mighty WHIRLWIND TO OVERTURN, OVERTHROW AND REVERSE THE CURSE THAT HAS BEEN UPON THE LAND. We must BE READY AND PREPARED for there will be a GREAT AMOUNT OF DISRUPTION in the Nation in the days ahead, but it will MARK THE BEGINNING OF A MIGHTY BREAKING AWAY OF MANY OTHER NATIONS FROM THE EU. Lastly, the Spirit of revelation shows me that as the Body of Christ in the Nation begins to walk in TRUE REPENTANCE, HUMILITY, UNITY AND KINGDOM AUTHORITY THE GLORY OF THE LORD WILL BE MADE MANIFEST OVER THE NATION, and as The Saints “ARISE AND SHINE” the heart of the Nation (which has grown cold in Love) will be REVIVED AND REIGNITED, WE WILL SEE NEW LIFE BURSTING FORTH FROM THE ICY DARKNESS AND GREAT PROSPERITY WILL COME TO THE LAND. I DECLARE AND DECREE THAT IN THE DAYS AHEAD THE EU (the bloc) WILL BE FULLY DISMANTLED AND DESTROYED, IT WILL BE BROUGHT TO NOTHING! PS: I have already shared this vision LIVE today on Facebook as some of you would have seen and heard. Please share for the purpose of prayer and intercession for the Nation at this poignant time. “This morning we’ve stepped through the threshold of yet another doorway. And know it’s going to continue to happen and it’s going to continue to accelerate, and we are going from one glory to the next. “Know that this is the season when open doors will be before us and we’ll step into the new moment. Notice the acceleration of time. Know that everything is going to begin to accelerate, and things that took a long time will happen in an instant, and we will go from season to season and moment to moment…. Russ recorded the video around midday in Ontario. Then, at that evening’s gathering of prophetic intercessors in The Turnaround in Washington D.C., a detailed confirmation was brought of the start of a New Era for the Ekklesia. After worship and Lou Engle’s declaration for worldwide harvest, Chuck Pierce teaches on what this Hebrew year 5778 and calendar year 2018 will bring, confirming changes I’d sensed over the New Year. From 54:20 mark (1st Video) Chuck refers to talks about the special nature of this meeting and of the year to ‘Go Through! Go Through the Gates’ (Isa 62), to prepare the way for a move of God in the USA and not stumble over the ‘stones’ of the past again. The meeting is all about going to places never visited and ‘Go Beyond!’ to where God is moving: on seeing, as watchmen, what’s coming from heaven as well as appreciating what God has done in recent historical moves. His saying this reminded me of a certain prophetic website losing (imho) its standing and prophetic integrity by judging and rejecting modern moves of the Holy Spirit – I was then surprised to hear Chuck affirm my thoughts!! “There’s never been anything on planet earth like what’s about to happen. Not just because we’re the best but because of what Jesus is building, and He said “I’ll build My Ekklesia”…He’s going to take this thing to another level! Rule and decree as the Ekklesia and shift nations (per recent posts here & here). How the meetings started after The Appeal To Heaven – dream of sailing ship and a wind came starting a movement, the sails of which bore ATH flag. Chuck prophesied in May 2017 ten months’ great turmoil in new Administration’s first year because of intense hatred from the forces that don’t understand/believe in the same spiritual destiny for USA. Then will come a 3-year turnaround. (1:44:20) Cindy Jacob, knowing Chuck’s prophecy and Dutch’s dream, gets word from God to tell him ATH is to be relaunched when the 10 months are up on 2/22, February 22nd, in Washington D.C, for a fresh worldwide prayer movement. Watch the video for much more on the NEW ERA – eg. vision of angels with tuning forks bringing new sound of heaven! Even Psalm 68:8 – The earth shook. the Heavens also dropped at the presence of the Lord. Even Sinai itself was moved at the presence of God in Israel. “There is a prophetic power that’s going to come in this hour that is going to begin to RIP OPEN WHOLE REGIONS. Whole regions are going to begin to receive the fire, the oil and the glory. The fire, the oil and the glory. The FOG of GOD (part #1 refers). And there’s even going to be; the Lord told me over the next several years there are going to be shakings. There are going to be shakings that are going to take place, even across London and across England. Shakings – shakings across this nation in the physical, in the physical. The Lord is going to shake the natural earth. I am not talking about massive or major earthquakes; I am talking about shakings that are going to be sizeable. People won’t be harmed, but there will be sizeable shakings and rumblings of an awakening that is taking place across the nation. I prophesied this in 2015 where I saw that there was going to be shakings and rumblings. And I’m telling you, the awakening is happening even now. And the presence of God, as it comes down, the earth is going to begin to shake; the shaking; the shaking, the shaking. There is a shaking that is going to happen. And it’s going to be a sign of the awakening; there’s going to be a sign of the awakening of the Spirit of God across the land. He is going to begin to awaken people out of religious churches. He is going to cause them to move out of the dead, dying body and move in to the living Kingdom. He is going to cause them to get out of the place of sitting in the pew, and moving into the performance of the Spirit of God, and the shakings and rumblings are going to happen across England. There’s going to be shakings. There’s going to be shaking and rumblings that are going to transpire. And it will be a sign of the presence of God dropping down on this nation. “Even in the City of London, I see that there’s going to be a shaking, a shaking. And it will be a sign of God’s hand coming down, His presence dropping down, stretching out His hand to perform signs and wonders and miracles. Not through just one; not through just two or three; not just through one or two or three; but the Lord is going to begin to move upon the many. God is releasing an Army, an Amy that will carry the frequency of heaven, the worship and praise and adoration of the Kingdom and they will begin to move into demonstration of power, and the land is going to shake, the earth is going to move. It will be a shock to many. “What God is going to do in awakening in the UK is going to shock Europe. What God is going to do in these fiery islands is going to shock, is going to shock, even Europe, into a place that they will not be satisfied with humanistic teaching and religion and tradition any longer, but they’ll rise up and recognise that there’s more; there’s more; there’s more; there’s more; there’s more, there’s more. “…..I am telling you, THE UK AND AMERICA ARE INTERLOCKED TOGETHER FOR AN AWAKENING. They’re interlocked together for an awakening. THE LION IS GOING TO ROAR SO THE EAGLE CAN FLY! The fire is going to jump oceans, back and forth, back and forth, back and forth, back and forth, back and forth. The fire is going to jump oceans back and forth. The fire is going to jump back and forth. “We’re on the prophetic timetable of heaven. “…..I am telling you, there is a separation coming that is going to distinguish those that carry true authentic Holy Ghost power, and those that are just religiously standing and trying to persuade people to stay within the boxes and confinements of religion. The future does not belong to religion; it belongs to Holy Ghost-filled people, and the church and the body of Christ. “Many of you know that personally I’ve been contending just for, not even just revival, but for an awakening to hit the UK. You know, revivals usually last three to five years but an awakening will last for an entire generation, up to 50 years! “And I believe that the Lord is uniting the UK right now – and I don’t just mean through politics, but I mean through the Spirit of God; that the Lord is uniting these islands for the wildfires of heaven to break out; for the Kingdom of God to invade every part of this nation, across every, every part of it; that there won’t be a place where the presence of God is not breaking out, where the power of the Holy Spirit is not evident, where signs and wonders and miracles are not just a part of our everyday life. “I am telling you right now, that there is a prophetic momentum that is happening in this nation right now that is unstoppable. There is an acceleration that is happening – and I am already starting to prophesy just underneath this mantle that’s here tonight – but there is an acceleration in the prophetic destiny of this nation. And I’m telling you that no devil in hell, no satanic system, no agenda from the enemy is going to be able to stop what God is going to do. Because the Lord is uniting a body. “I was in Perth, Australia, earlier in the year; I believe it was in July. I was taken to a tower that’s there in the city. They brought me there to just kind of sight-see, and there’s a tower there in Perth, and there’s these bells that are there, in the city. And they’re from England – they are actually from St Martin-in-the-Fields [in Trafalgar Square RB]. They were rung during some of the greatest achievements and greatest victories of England. They are over there and they were transported over to the nation of Australia, in the city of Perth. “And the Lord began speak to me as I went back to my hotel, back to the place where I was staying. I got caught up in a vision. And I saw Big Ben and I saw in the spirit the Lord was going to cause a sign and a wonder to come from Big Ben; that it would be a sign, because I’d been walking out this thing that I prophesied last year…and what God was saying, that we were going to have to walk through for a season in the UK, but that there was going to be a great awakening that was going to come. “And, the Lord told me – in this vision, I was seeing Big Ben – and the Lord told me, he said I’m going to cause a sign and a wonder to come; a sound that’s going to come, and I’m going to silence my enemies. “And as I was in this encounter, suddenly, like a fog – a fog began to come down. And a lot of times you think a fog is just something that’s not good. And the Lord said, ‘It’s the London fog’. And I said, ‘London fog?’ I said, ‘Oh!’ and He said; ‘It’s the fog of my presence’. Published with permission of UK Prophetic Words. The whole video of this exceptional, powerful meeting is highly recommended. Read Charlie’s Keep Our Eyes on Big Ben; for more scroll my Big Ben tag. Thank you to Suzanne Payne for reminding me in her comment on the previous post (on pruning dead-wood in Anglicanism) about a word brought by Sarah Rowlinson on our nation’s spiritual history and legacy. ‘And then secondly, I saw a branch of revival coming through a branch of the Church of England. Not the whole thing, there’s a branch of it. And it’s coming strong, and it’s coming steady, and it will build significantly this year. And I saw that in some of the major cities in our country, Cathedrals would be filled once again. And the old church buildings will be filled with the sound of worship. ‘And these places will be empowered with acts of service again that this church denomination was once renowned for. There’s an activation in this stream, there’s a mobilization in this stream. And I felt like these churches would come into the heart of community activities once again, they would come into even places of government and influence for the good of the whole communities in which they serve. ‘And I felt like the Lord was saying to the rest of the brothers and sisters around these communities to support what the spirit of God is doing through these churches, put down some of your theological barriers and some of your ‘oh they’re just the religious lot, we don’t really deal with them’, that type of thing, put that down and support and serve because it was Him, and He was mobilizing a sense of revival through this stream. ‘Wisdom and Counsel will be found in these churches for many. I saw many going, like they used to, and say: “I have questions, I don’t understand, my marriage is falling apart, my business is falling down the tubes, I’m going to go and find the vicar.” And that coming back into our land, and that it was a healthy thing. ‘So, I’m prophesying that bit that I’ve seen, not because God’s not going to move dramatically , dynamically into all the other church streams across the nation, that’s just the bit that I see, and it’s not a stream that I’m a part of. The location of that ‘spiritual guard’ is particularly interesting in view of the necessity for Therasa May to include the conservative Christian Democratic Unionist Party of Ulster in her parliamentary majority. Also, that intercessor and seer Veronika West lives on the western isle of the British Isles. In this follow-up RJ Dawson refers to the kind of clerical control that I reacted against when young but have noticed since the Toronto Outpouring an increasing number of ‘PCs’ who are walking in the Holy Spirit, a couple of whom are our local Anglican leaders! From the very beginning the Lord built into His ministry model committed followers pledged to carry on His legacy. He trained distinctly loyal men recruited largely from the working class and lower levels of society. He had no need of anyone already vested in and sold out to this world. Such men could never be counted on when the going got rough. They were culturally comfortable and would inevitably desert or betray Him. As it was, Judas Iscariot proved that even qualified disciples could go bad.